I needed to meet up with the Great One to hand over all the goodies we had brought back from Singapore - including some of her favorite instant noodles - so she roped me in on one of her reviews. 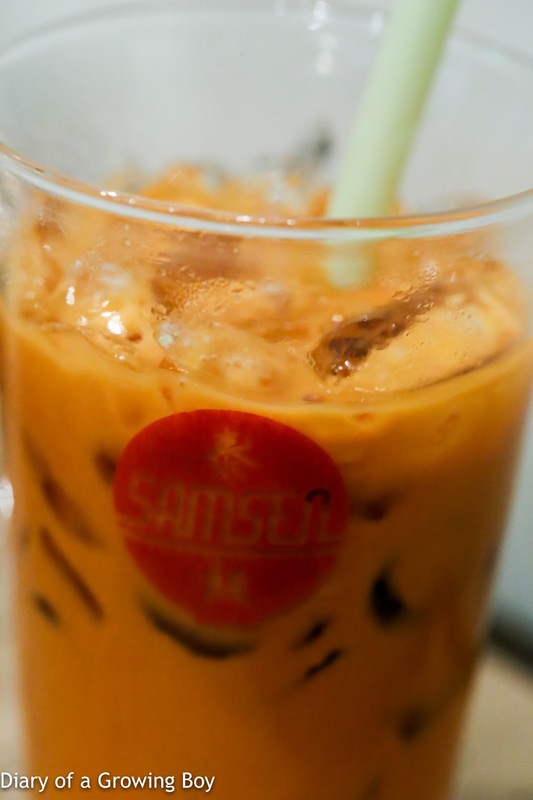 Tonight's victim was Samsen, and since I know next to nothing about Thai street food (I refuse to eat it on account of hygiene fears dating back to the '80s), I figured I would also rope in my Thai foodie friend. 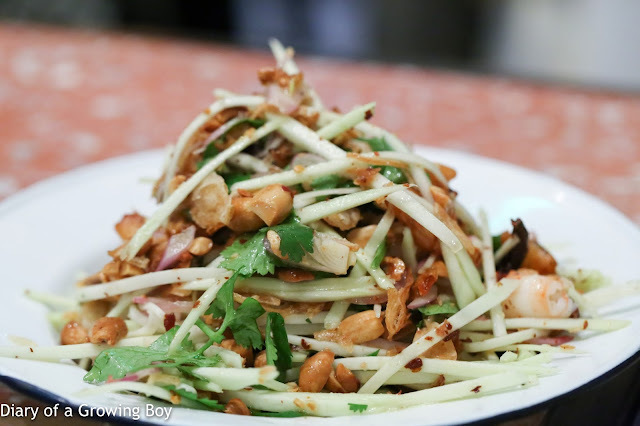 Green mango salad w/ tiger prawns, crispy shallots, chili and coriander - this was a little spicy for me, but very nice. 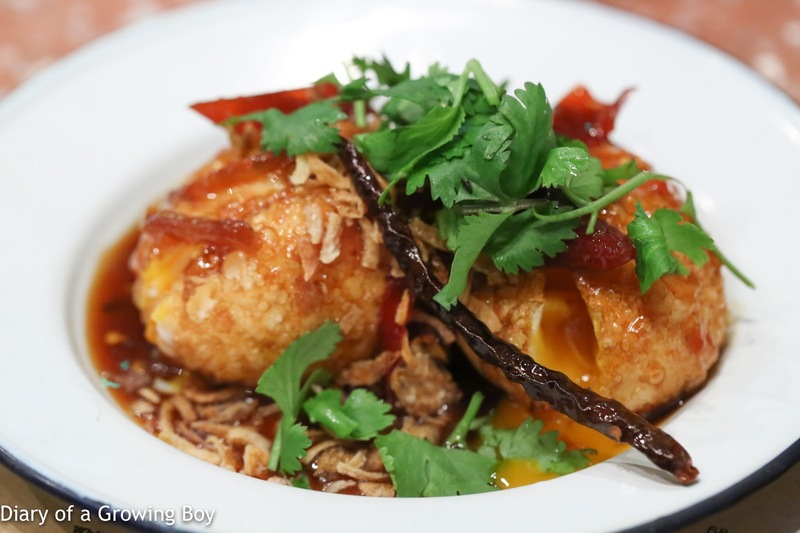 I especially loved their use of dried shrimps, as they had a lot of flavor and also provided a contrast to the fresh prawns. Flavors were well-balanced here. Fried marinated pork collar w/tomato and chili dip - probably my favorite dish of the evening. 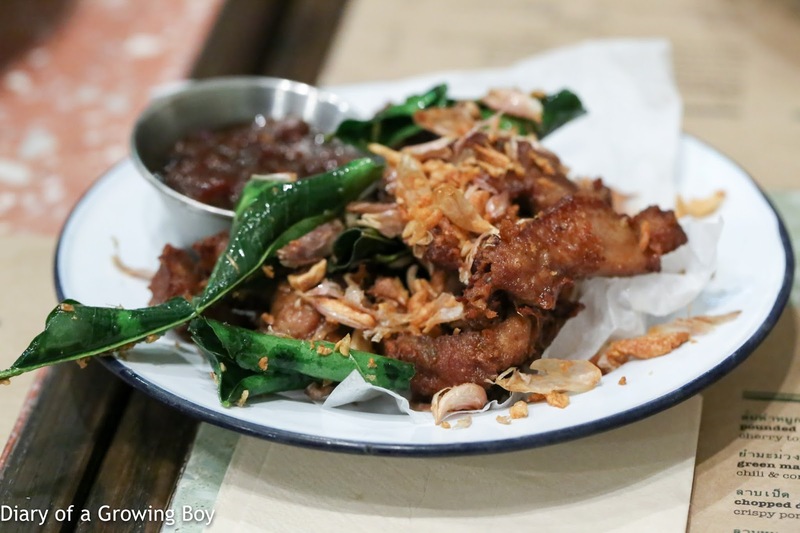 The pork collar was, naturally, very tender (a plus); it was fried (another plus); there was a ton of deep-fried garlic on top (yet another plus) which reminded me of Polo Fried Chicken in Bangkok; and came with fragrant kaffir lime leaves. and it was! 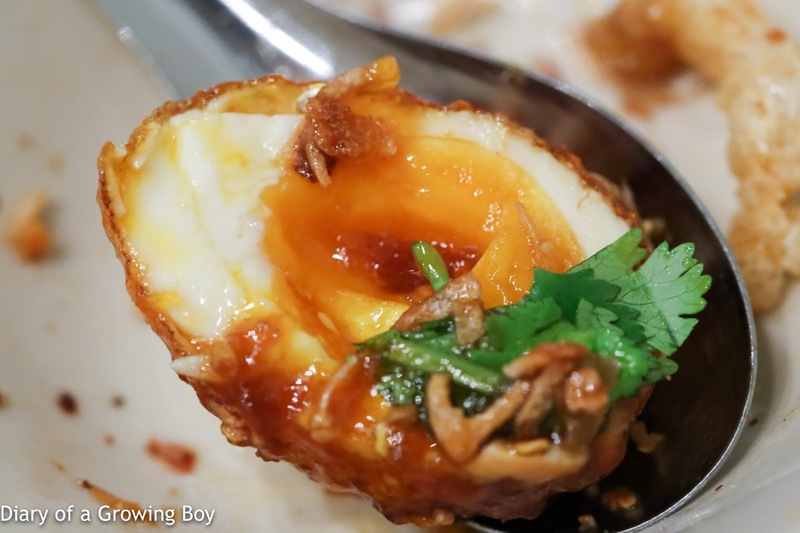 The yolk was still runny, and I loved the crispy exterior. The chili jam was also very tasty, with the tamarind providing both acidity and sweetness. Chopped pork salad w/ fresh Thai herbs, pork skin and spicy lime dressing - probably the weakest dish tonight. The larb came with some acidity thanks to the lime dressing, and thankfully wasn't too spicy for me when I picked out all the chili. 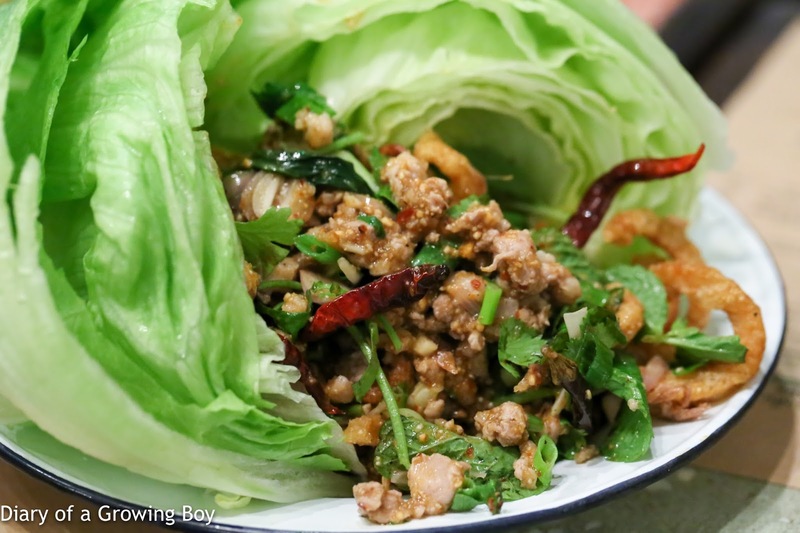 But did they really have to give us half a head of iceberg lettuce to go with the larb? 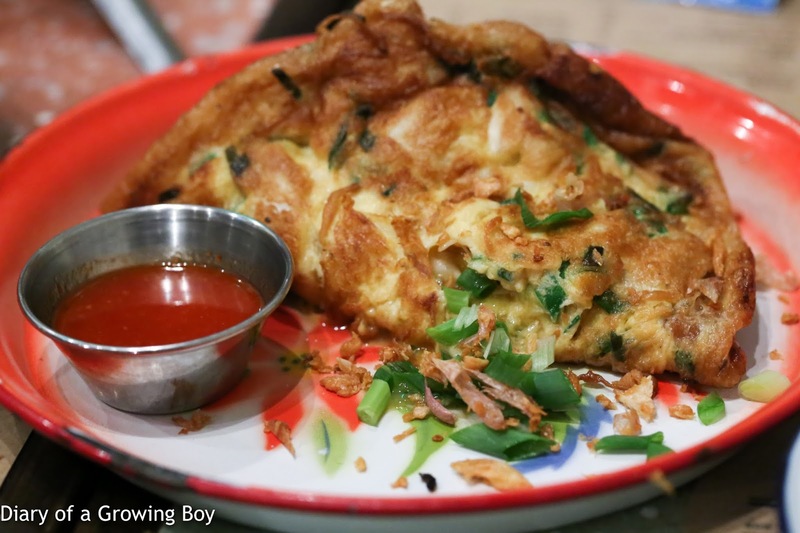 Thai omelet of crabmeat and spring onions w/ Siracha sauce - the Great One was wondering whether this would be as good as the one cooked by Jay Fai, but at a mere HKD 108 in Hong Kong versus THB 800 or 1,000 in Bangkok... the answer would be a resounding "NO". Having said that, the chef wasn't being stingy with the crab meat, although the omelet was slightly on the greasy side. Still tasted nice, though. 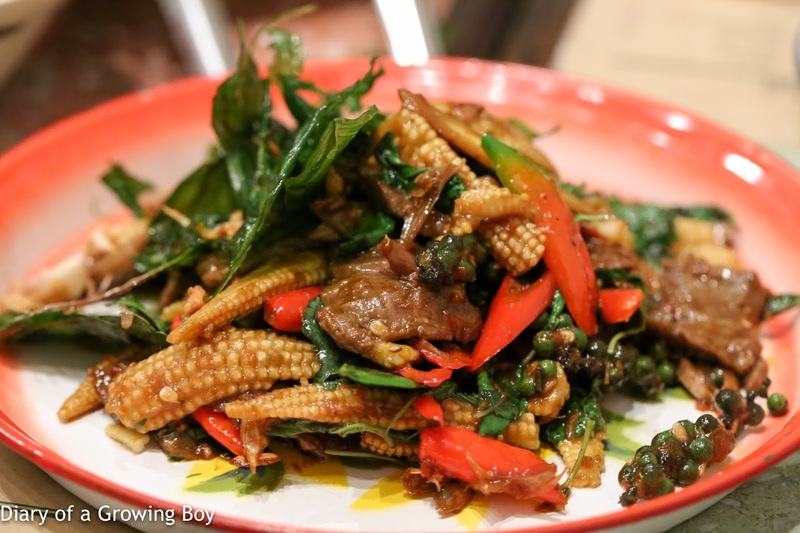 Stir fried wagyu beef w/ wild ginger, garlic, chili and red basil - this was the most spicy dish tonight, as I couldn't avoid all the chili seeds and flakes which had stuck to the slices of beef. 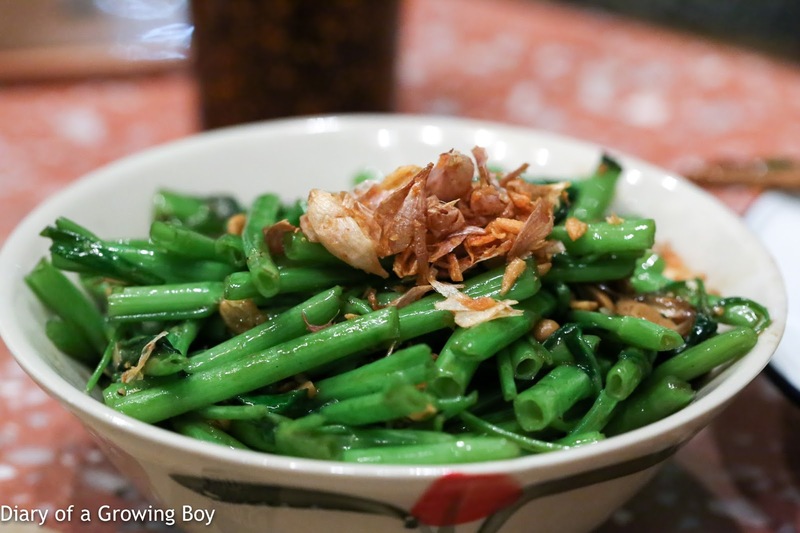 Wok fried Thai watercress, yellow beans, chili and garlic - a little bit of veg is always good, and these came with fermented soy beans. I'm guessing the "yellow beans" is a literal translation from the Chinese? 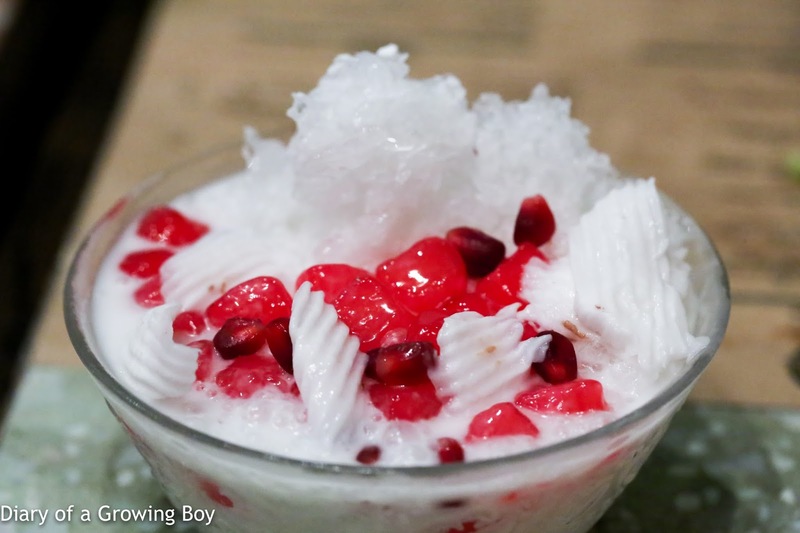 "Red rubies" served on shaved coconut ice w/young coconut meat and pomegranate - this is a pretty classic dessert, although I must admit that this is one of the better versions I have had. The jelly covering the chunks of water chestnuts definitely tasted a little "bubble gum", although that's not necessarily a bad thing. I was actually surprised to see real pomegranate seeds added here, along with crunchy pieces of coconut flesh. 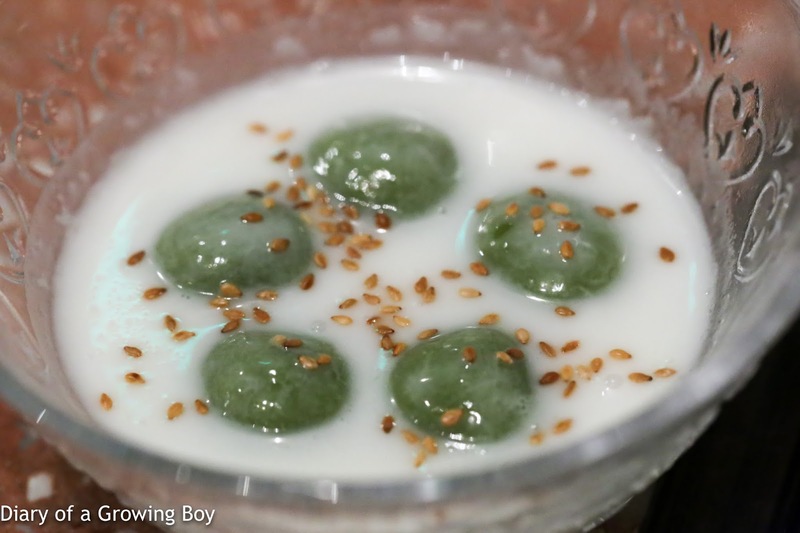 While this is a sweet dessert, I was a little taken aback by how savory the coconut milk was. Pandanas coconut dumplings in warm salted coconut cream - the coconut cream was definitely pretty rich, and sprinkled with sesame seeds. 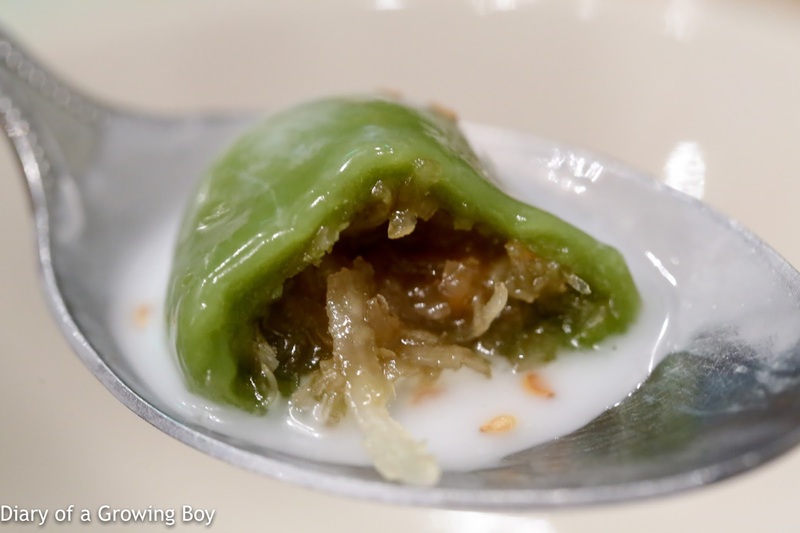 The pandan dumplings were stuffed with shredded coconut inside, which was very sweet thanks to the palm sugar. Yum. I was really, really stuffed. As usual, the Great One simply over-ordered, since there was no way that the three of us could have put away 8 savory dishes and 2 desserts... 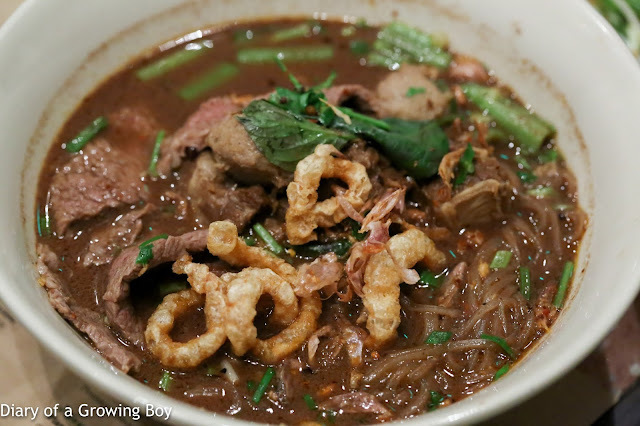 But I was happy to have come along, and thankful that my Thai foodie friend could provide some color for us.